Remember the wireless charging pad Apple announced a year ago and then never released? Well, word on the street is it’ll finally launch next month when Apple releases its new 2018 iPhone models. And when it finally does launch, it’ll apparently cost a whopping $200. Forget that noise. 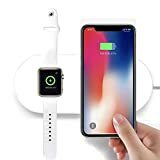 The FACEVER 2 in 1 Qi Wireless Charging Pad is a single sleek wireless charger that can charge your iPhone and your Apple Watch at the same time. It even supports 7.5W fast wireless charging. But the best part is the price: While Apple is expected to charge $200 for its AirPower wireless charger, this model costs $35!